Over the Top of the World - Explorer Will Steger's Trek across the Arctic. Will Steger and Jon Bowermaster. Illustrated by Allison Russo. New York, NY: Scholastic Press, 1997. Distributed in Canada by Scholastic Canada. Review by Jo-Anne Mary Benson. "What I saw amazed me. A wall of ice, 20 feet tall and as long as a football field, was moving our way as if being pushed by the blade of a giant bulldozer. Blocks of ice as big as cars were falling off the top of the moving wall and being crushed beneath it. It moved toward us, threatening to crush us, too." In Over the Top of the World, readers are rewarded with a visual and literary account of Will Steger's four month journey from Russia to Canada. The expedition that involved six team-mates, 33 dogs, and two tons of gear used only sleds and canoes to achieve its objective. The group's adventure is superbly documented in this book. Steger is a world reknowned explorer who has climbed mountains, navigated rivers, and extensively explored polar regions while Bowermaster is an award-winning environmental journalist credited with both books and articles. This dynamic pair have shown themselves to be superb writers of children's literature. Over the Top of the World is a non-traditional children's book that will hold appeal for a variety of age levels as it is written in language that is easy to understand and yet not condescending. The combination of photography, informative sidebars and excerpts from diary entries helps in maintaining a high level of interest throughout the book. The authors' effective use of analogies to illustrate a point makes things more tangible for younger readers. For example, the squeezing of Arctic ice "sounds like a million windows being broken simultaneously". The narrative allows readers to become totally immersed in the excitement of the adventure and vicariously experience the challenges and emotions relating to such an expedition. The expedition's members were continually challenged by weather, terrain and physical problems. Through their candid diary entries, the authors give readers a reality based glimpse into the obstacles the team encountered on the expedition. An interesting feature, one seldom seen in any expedition book, is the recognition given to the dogs which played a significant role in the undertaking. 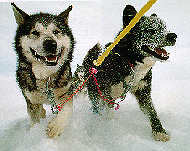 Individual profiles describe each dog's characteristics, personality and position within the team. Articles on communication, wildlife and Arctic dress provide excellent support information and beautifully complement the book as a whole. Over the Top of the World could enhance a variety of academic progammes from Geography to English. As it is short, visual and totally rewarding, it can be fully absorbed in one sitting or sampled and savoured piece by piece. Recommended for both public and school libraries. Jo-Anne Mary Benson is a writer/reviewer for North American books, magazines, newspapers and journals.